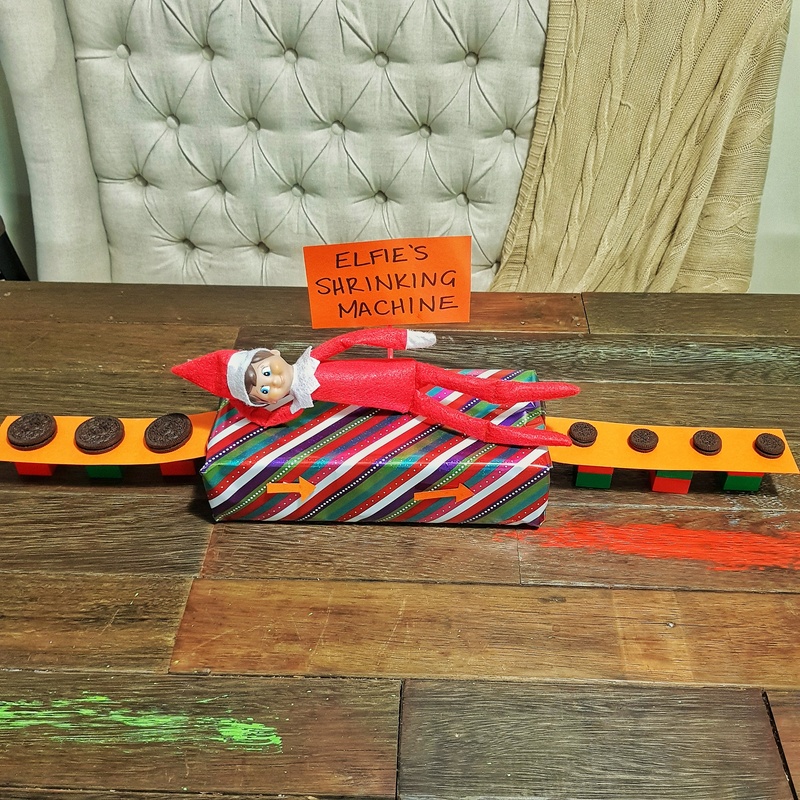 This is our third year with Elfie!! 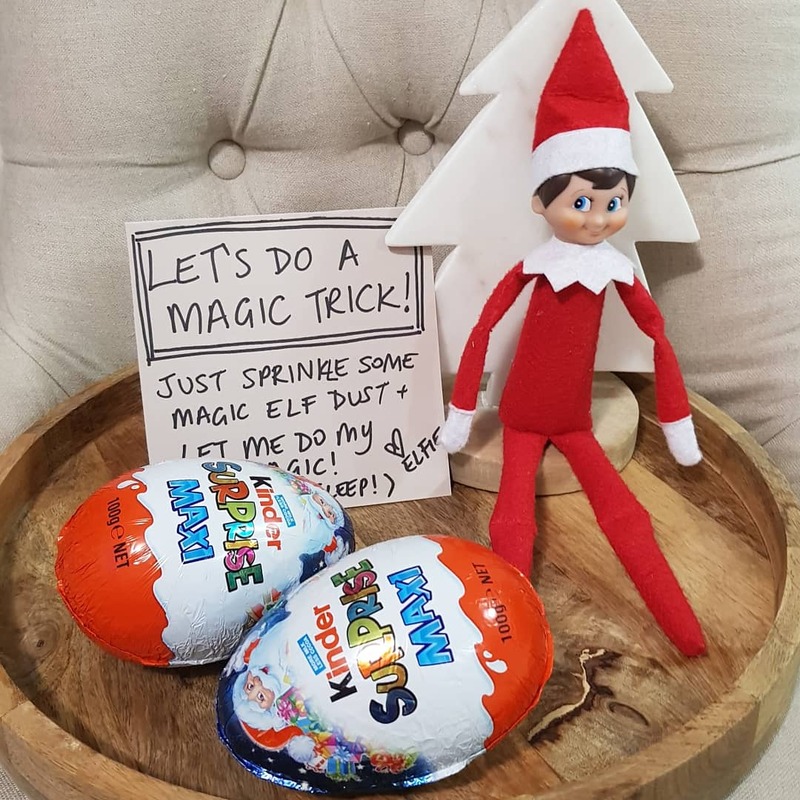 Elfie spent waaay too much time on his Elf antics last year – so pressure’s on for a fun 2018 with our 4 year old boys and 1 year old girls!! 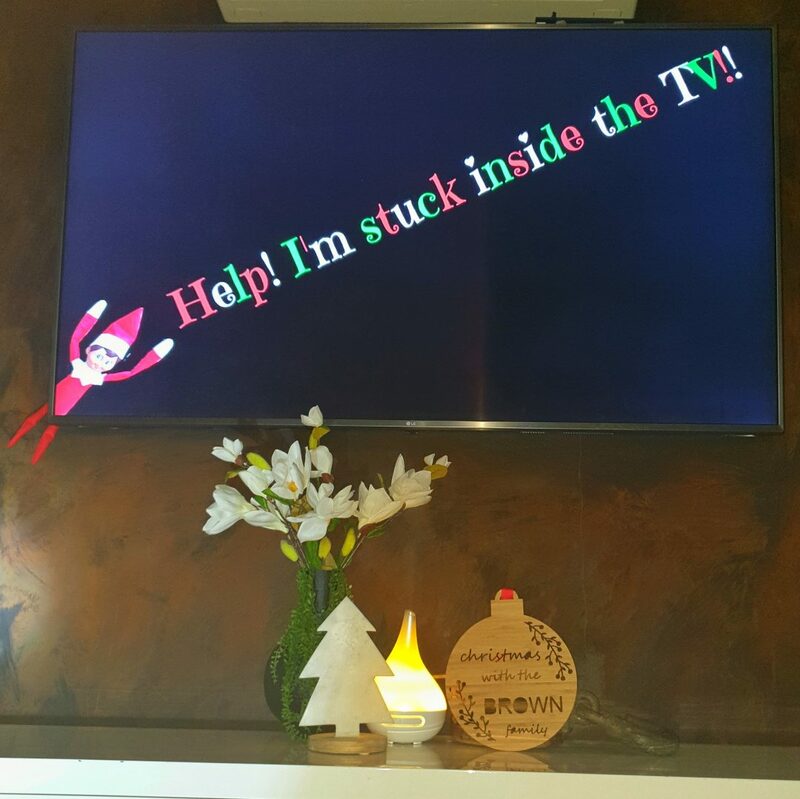 Day 2 in the Brown family household this year is Elfie half getting stuck in the TV! 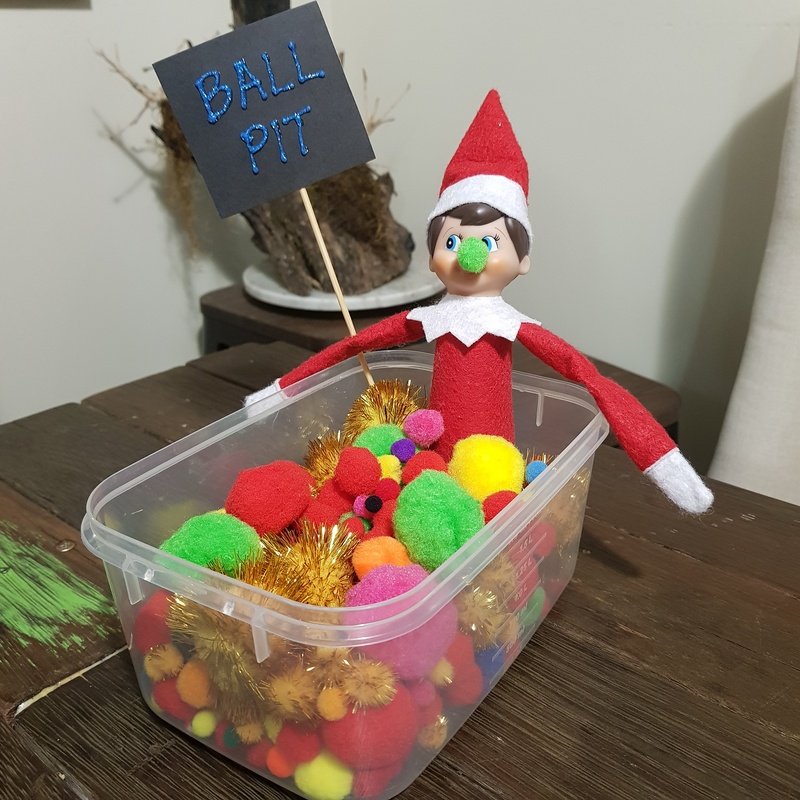 Elfie (aka ME) is not a pro photo editor – this is a massive home job and this is the best I could do – but looks pretty effective on the TV screen!! Click on the picture below to download, save it onto a USB and plug it into your TV/mirror it to your TV (or whatever other fancy technology there is these days to put an image onto the TV)!! 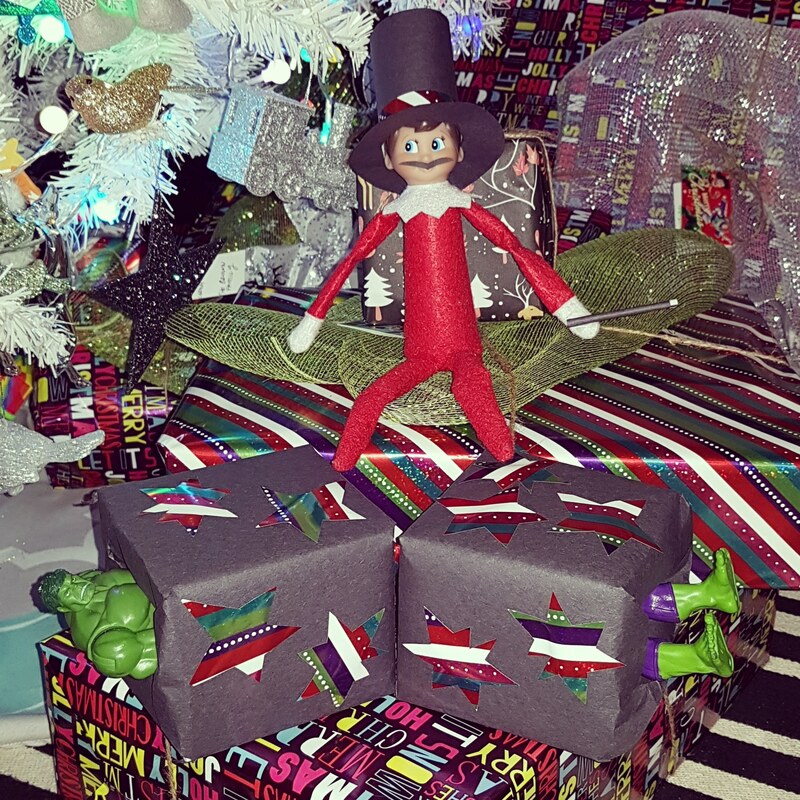 Then just squeeze your Elf halfway and tape them behind the bottom left corner of your TV! 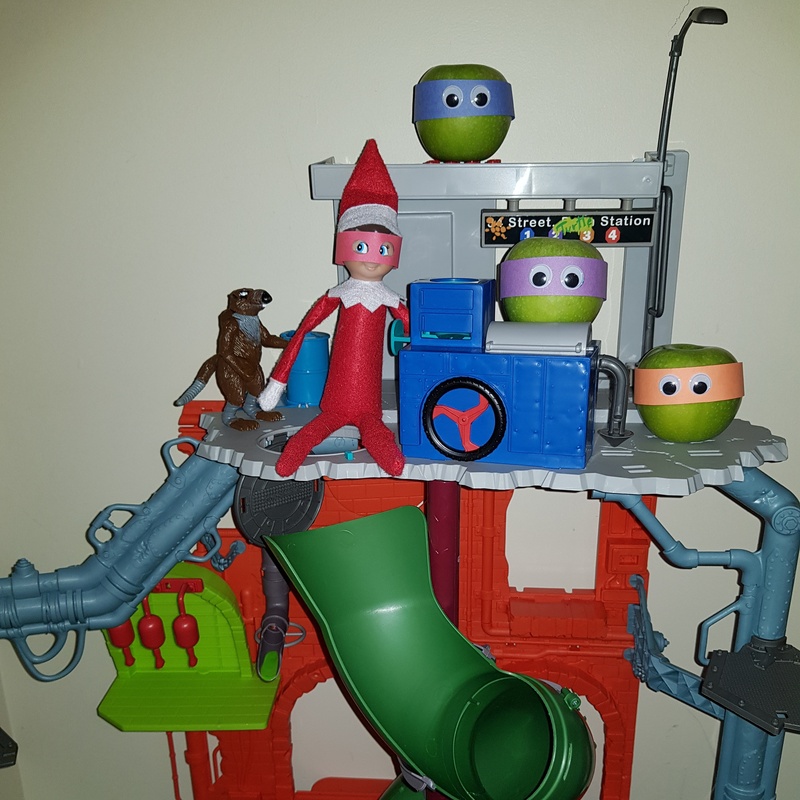 It can either be a TV free day in the house since the Elf is stuck in the TV, or you might be able to see him stuck on the ‘Elf Channel’ (when the other TV channels work normally)! If you are excited as I am to use this picture – please share the love – tag me in your photo and/or add this website link! Thanks guys! Merry Christmas!!! 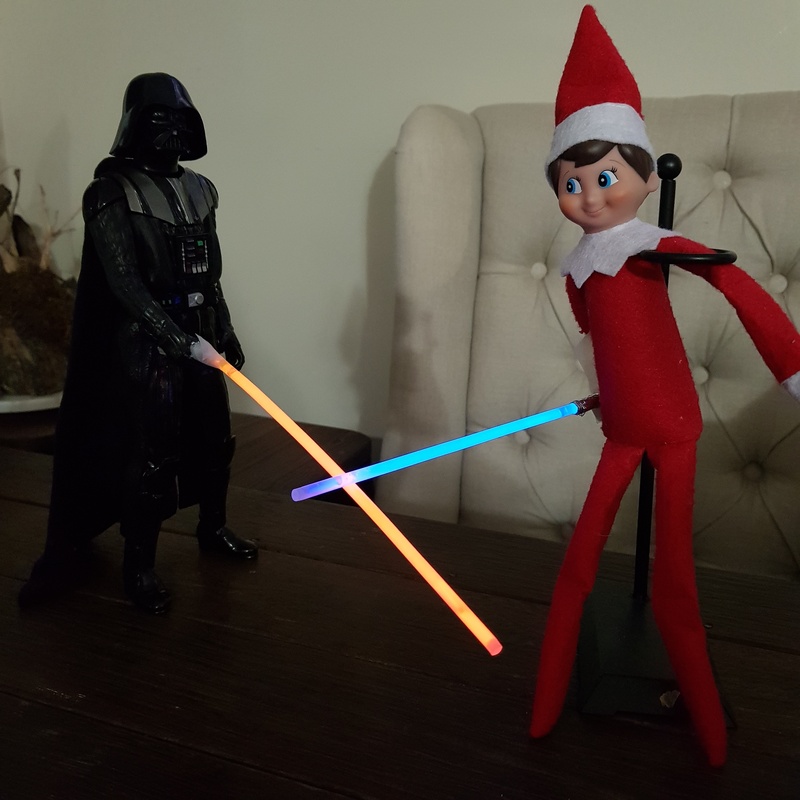 I’ll miss all the Elfie fun from this year, but I’m glad to get my nights back for Netflix…and sleep!! 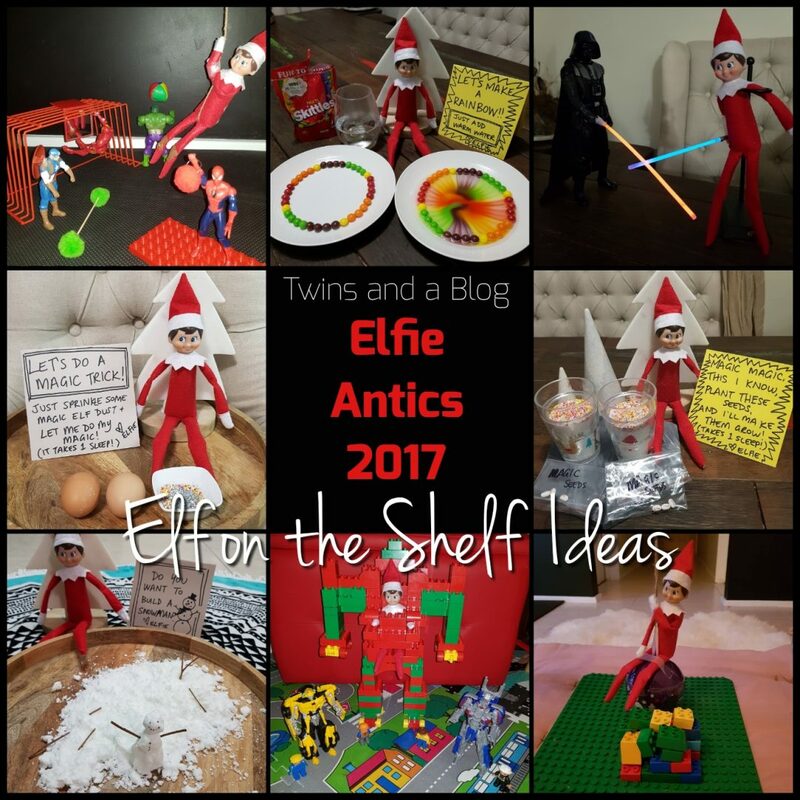 I posted each day of Elfie on my social media pages, but here the highlight reel of Elfie’s antics for 2017! 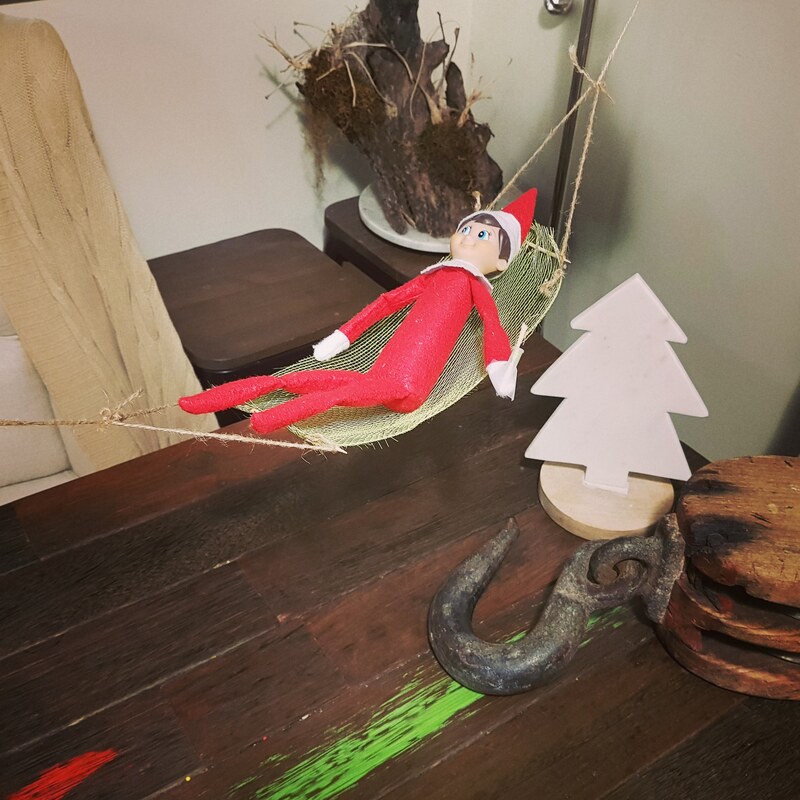 Day #1 – Hi Elfie! Look who’s back from the North Pole!! There are going to be 2 very excited boys in the morning!! 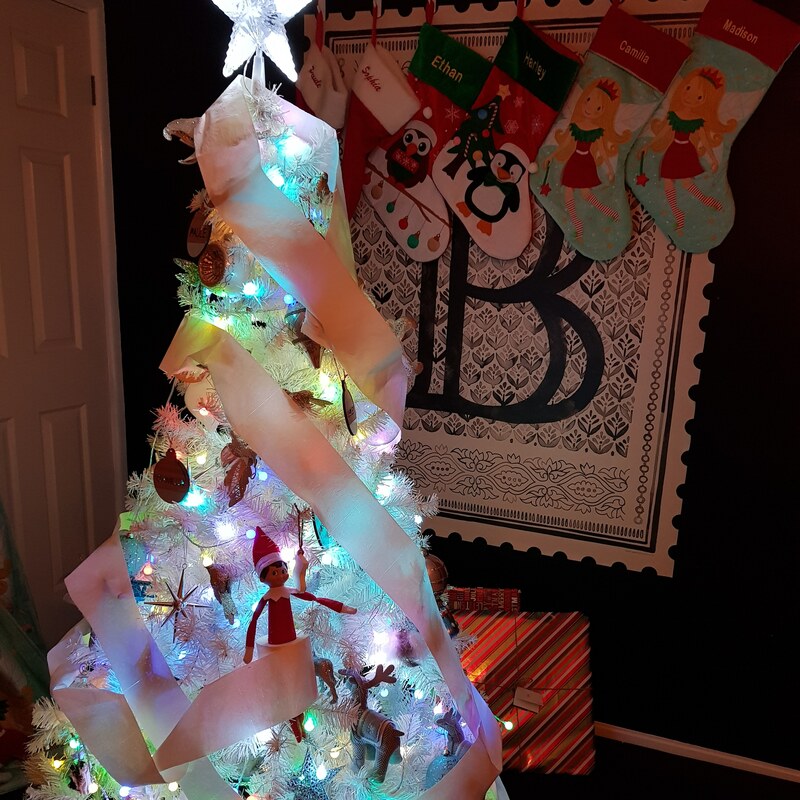 We started this tradition last year but they were still a little young to appreciate it, this year will be the first time they will truly enjoy the spirit and magic of Christmas! 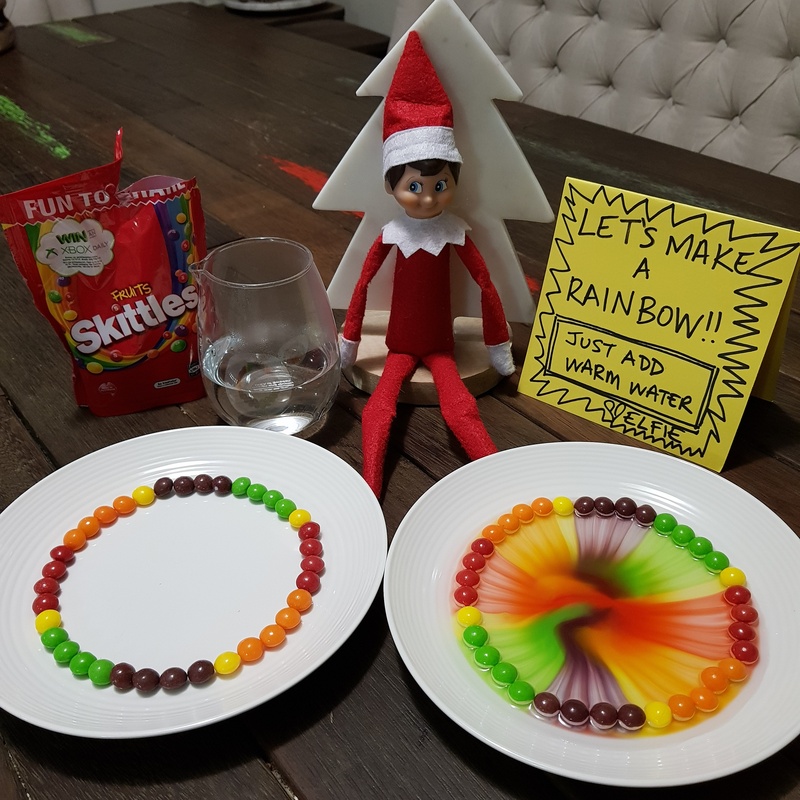 Elfie’s magic dust is made of rainbow sprinkles and glitter. I was going to use the standard Kinder Suprise eggs which are the same size as a normal egg but I couldn’t resist these huge Christmas Kinder Suprise ones! It is an easy one to switch over the next night! 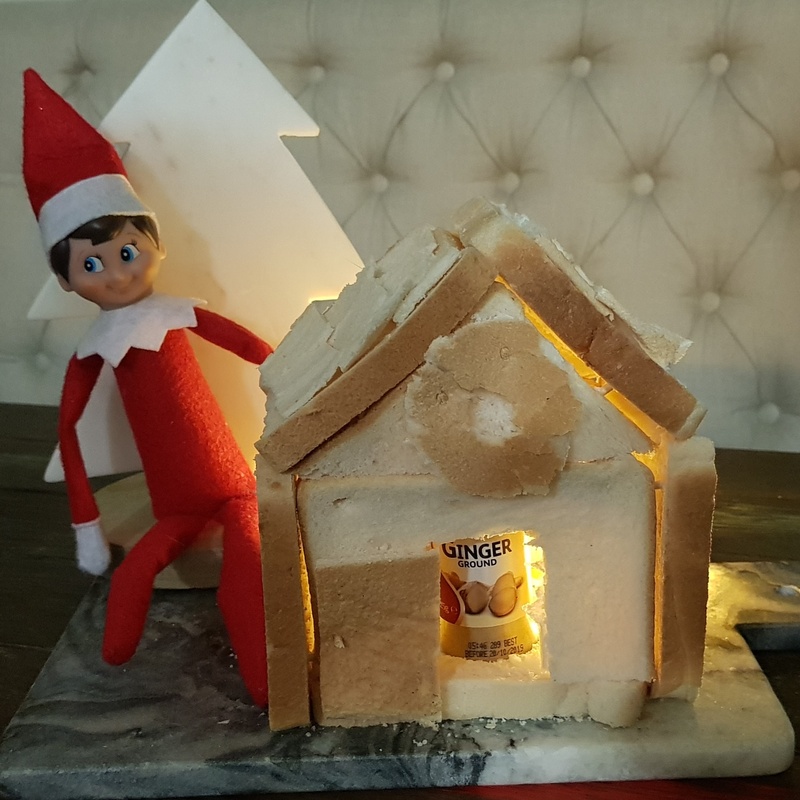 Day #11 – Meet Frosty! Craft paper cutouts and tissue paper for the scarf/hat. The hardest part of this was cleaning all the magnets/coupons/letters/photos/cards off the fridge! All these magic tricks topped with Frosty appearing the night before was hard work! 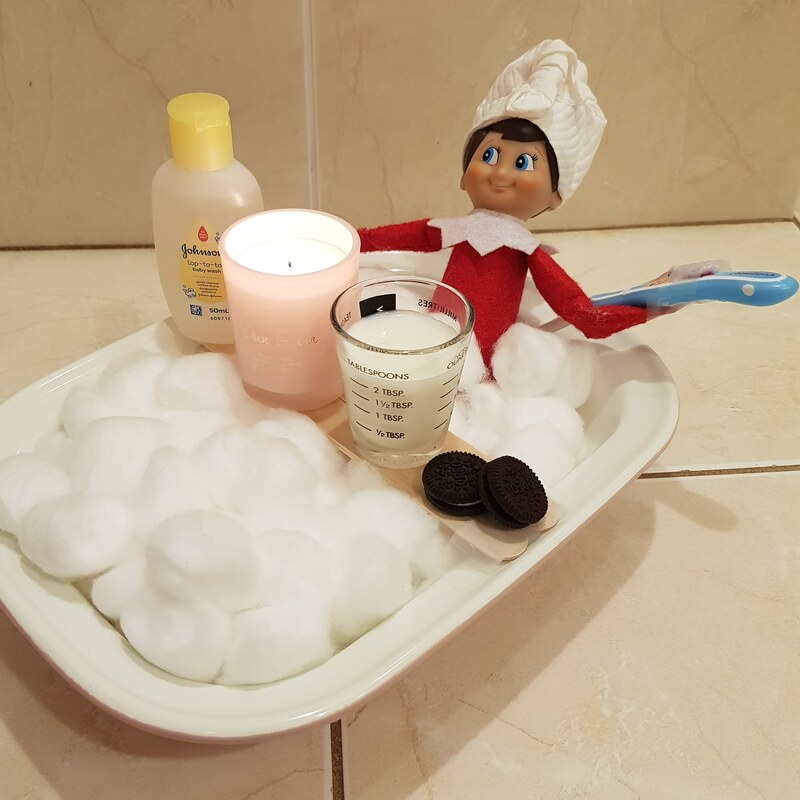 Time for Elfie to relax in a nice bubble bath, complete with Elfie sized body wash, candle, shot of milk and mini oreos. This was an encore from my 2016 fave! Last year I used a clear bauble filled with M & M’s. This year I used a Cadbury Snowbites ball. 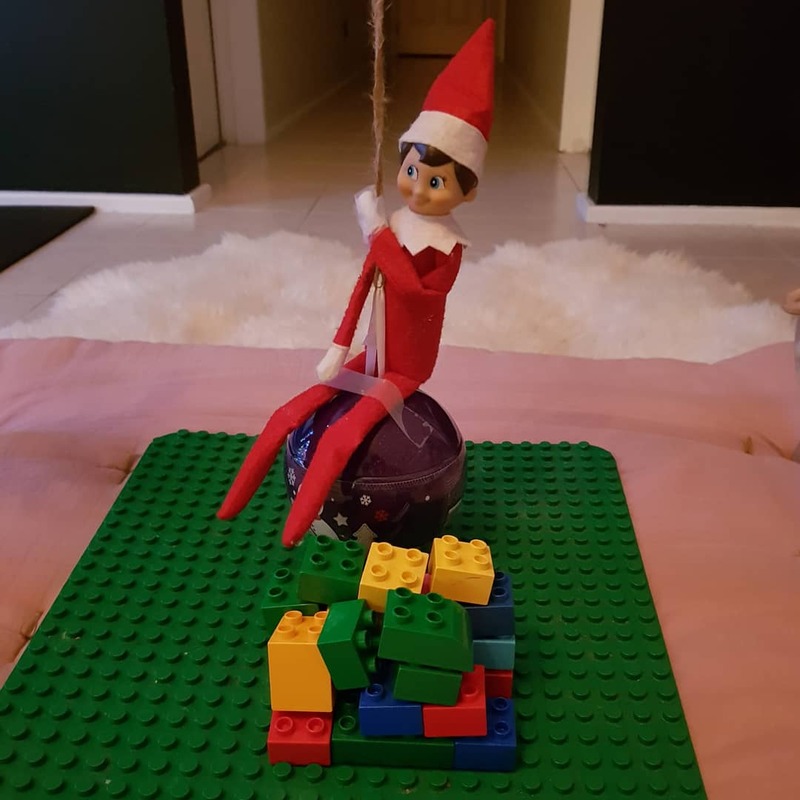 The boys had so much fun with this wrecking ball! See wrecking ball video HERE. The soil was made of white sugar topped with sprinkles. 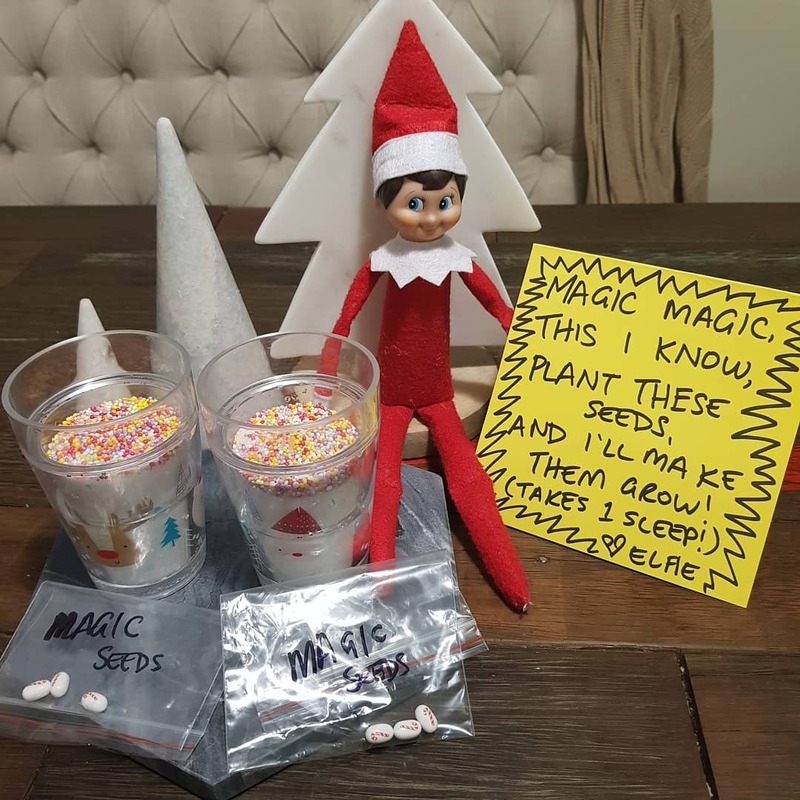 I put it in cups for some depth so the Candy Canes can stay upright when ‘planted’. The Tic Tac’s are Candy Cane flavoured ones (but you could use red or white ones). 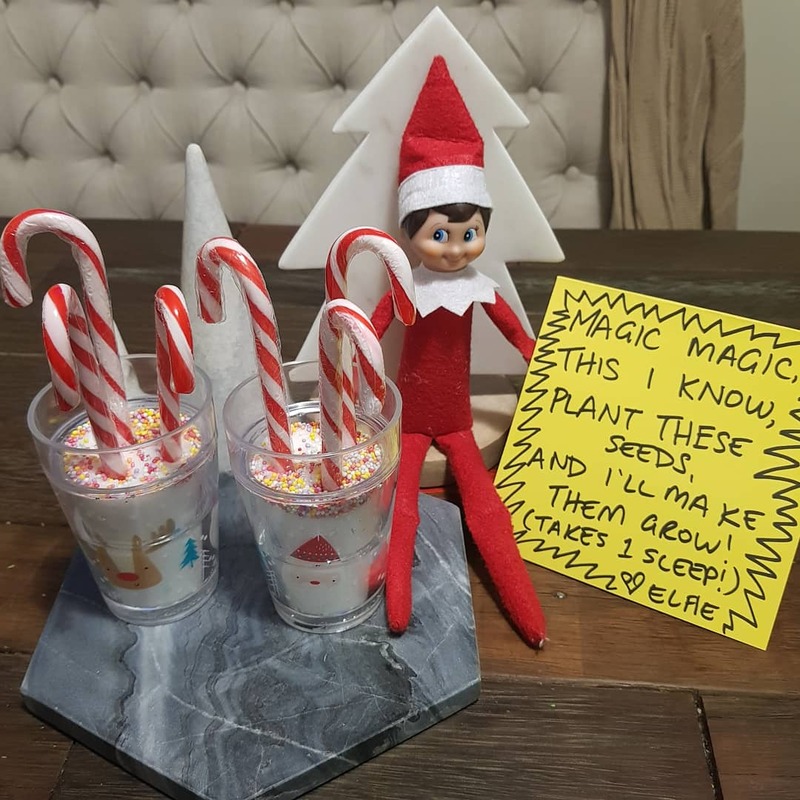 I love these 2 day things as the 2nd night you just need to plant the Candy Canes! 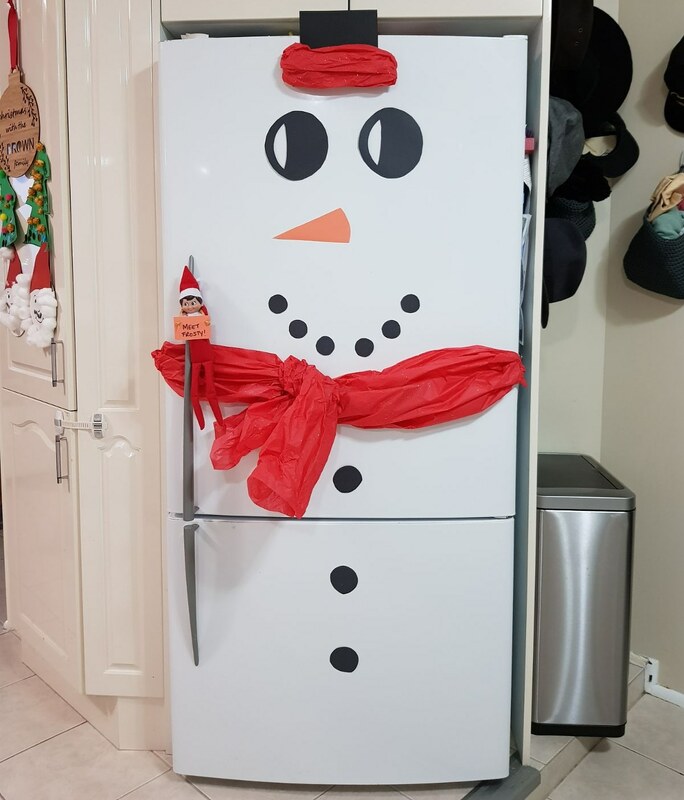 Day #17 – Do you want to build a snowman? 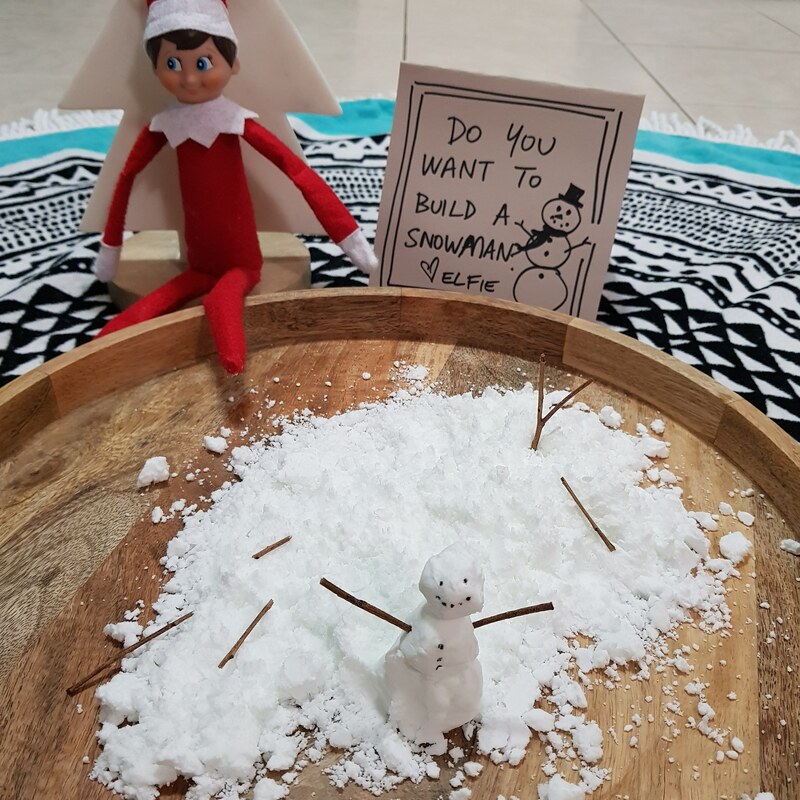 This was one of the boys’ FAVOURITE Elfie moments with this sensory play complete with Play Snow! It looks like snow, and can be moulded into fun little shapes! CLICK HERE for the easy Play Snow recipe! Have you G.O.T the Christmas spirit? 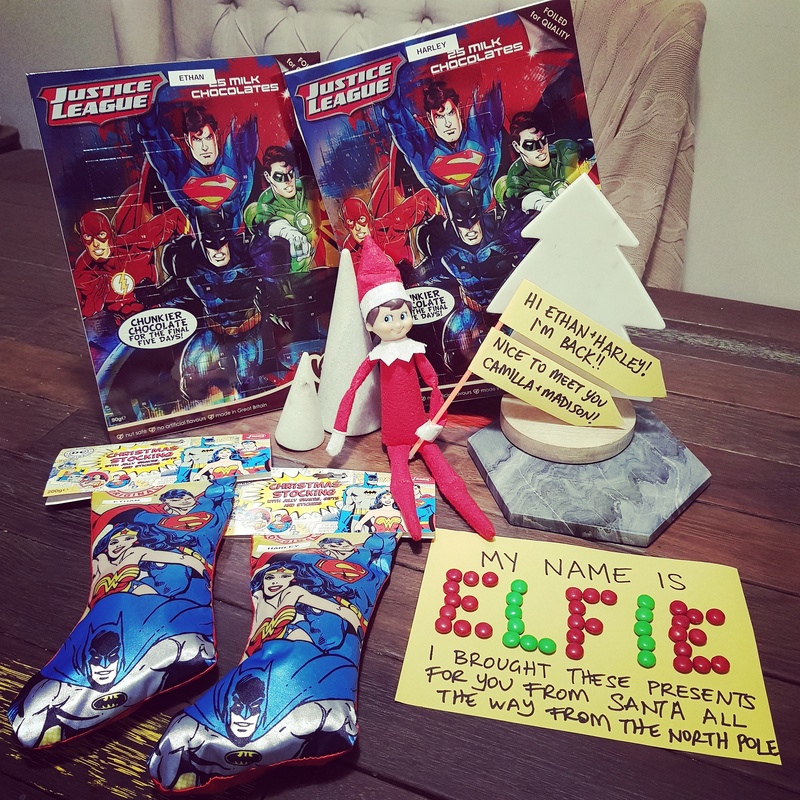 Elfie needs a lie down and cocktail with all this flying to and from Santa every night! 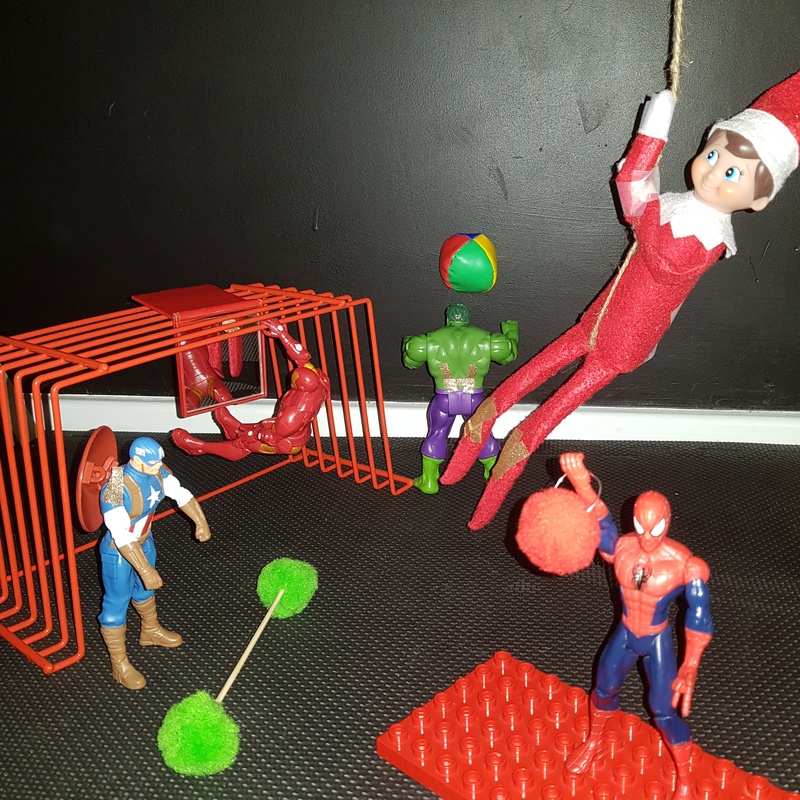 Day #20 – Elfie the Magician – the ‘cutting Hulk in half’ trick! 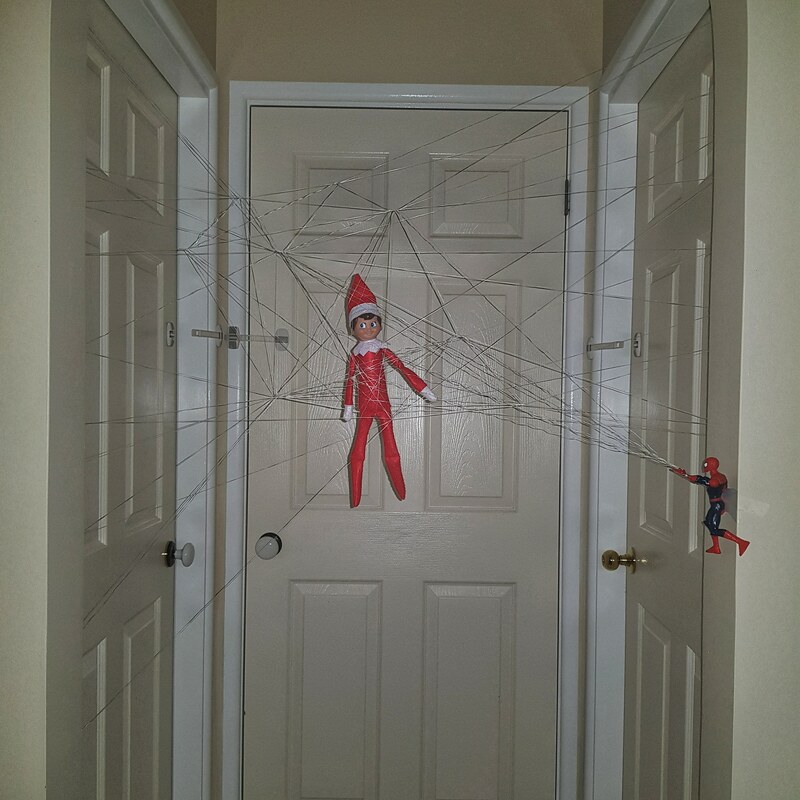 No sawing or cutting involved, just pure Elf *magic*! 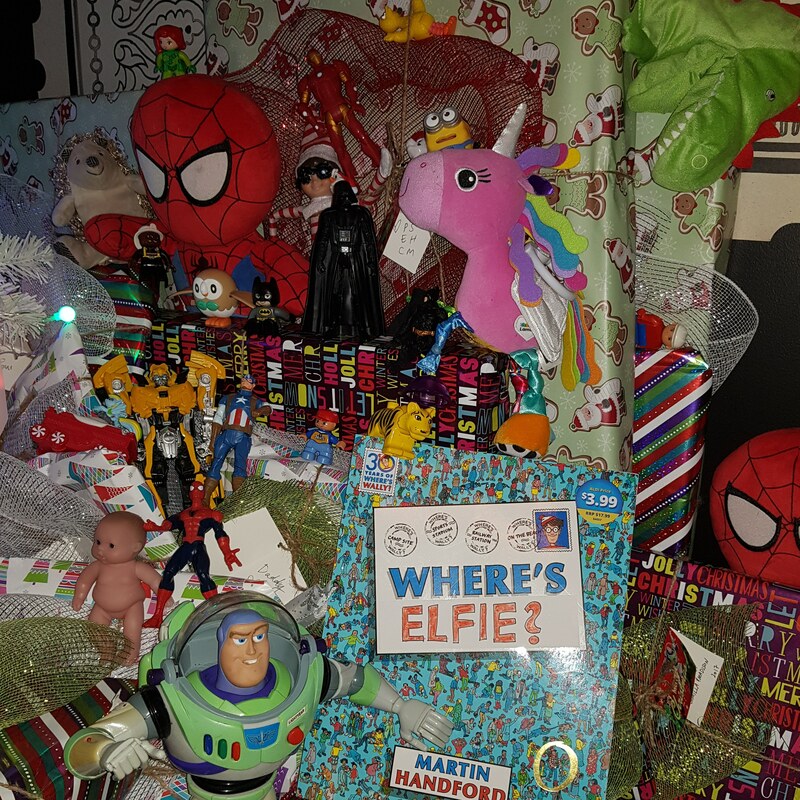 Day #21 – Where’s Elfie? 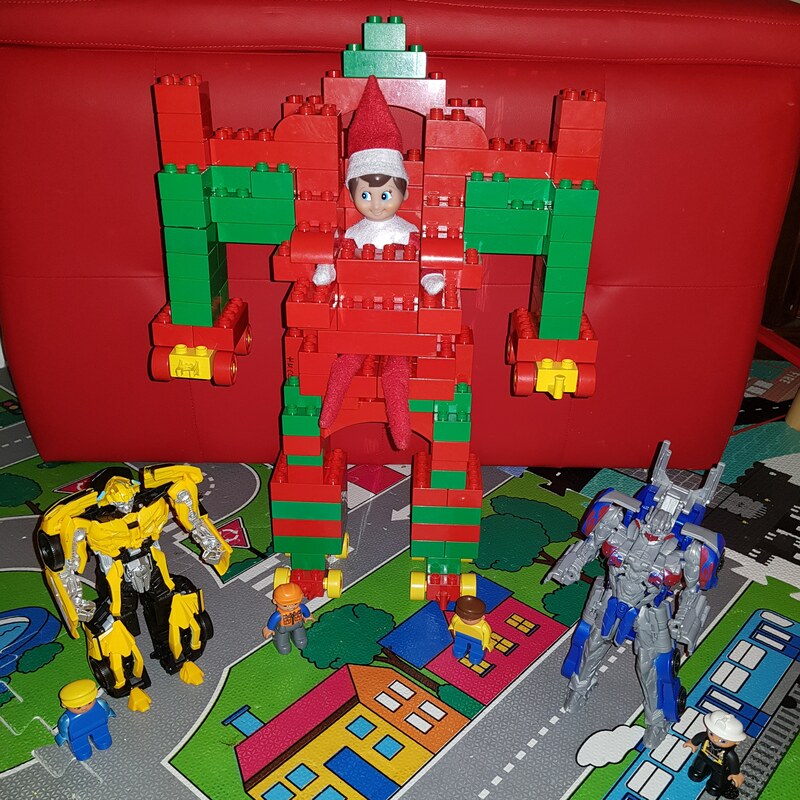 This was a combined daddy and mummy effort and was one of the boys’ fave Elfie moments!! 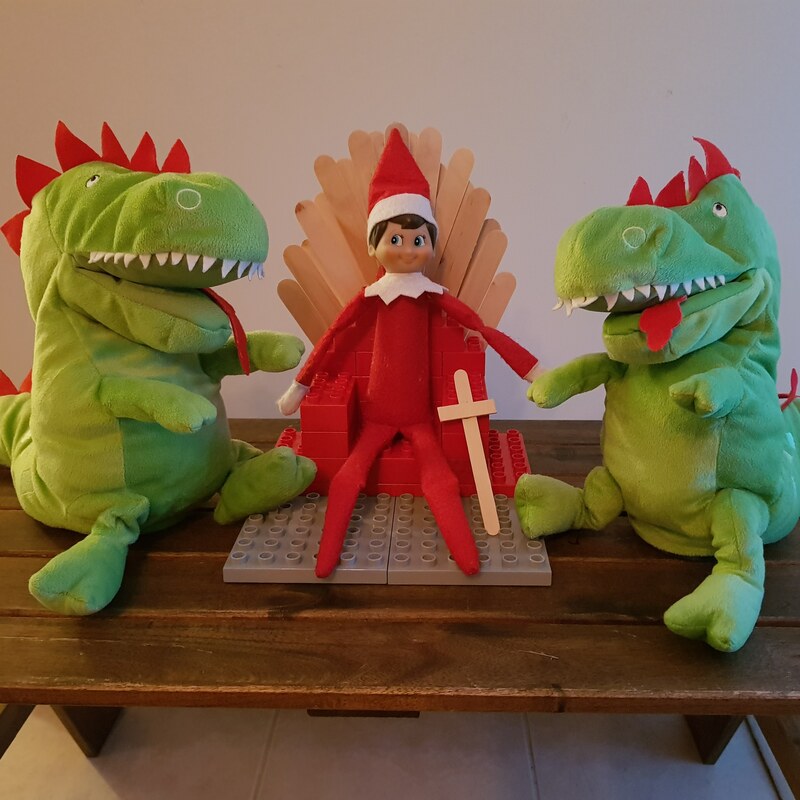 Day #24 – Elfie’s last day before Santa arrives! Today is our last day together before I fly back with Santa to the North Pole. 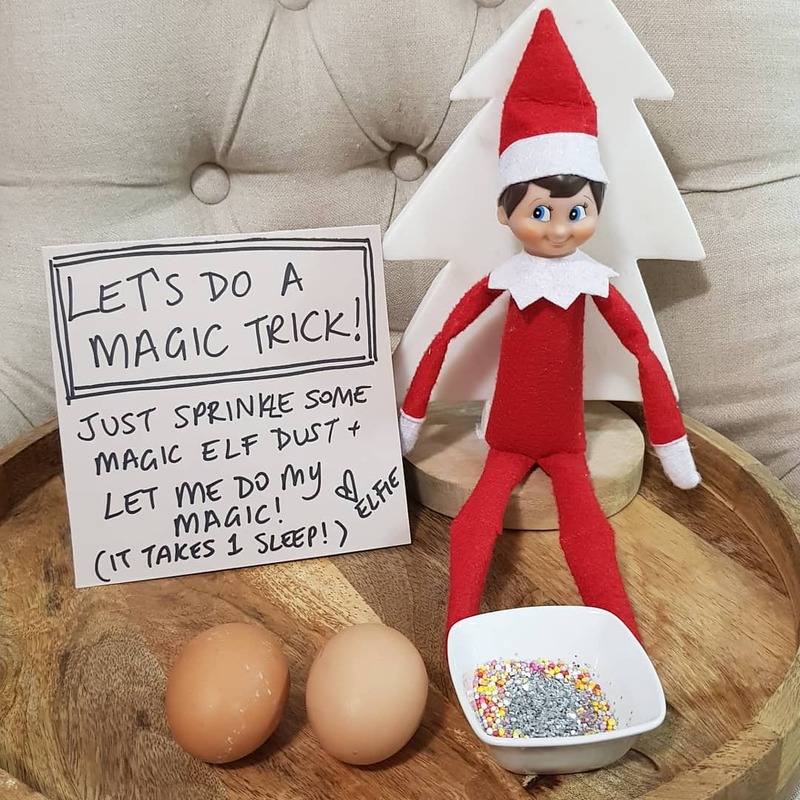 Let’s have cuddles and take photos together – here is some magic dust to sprinkle on me so I can fly back home with Santa. I have given your mummy the recipe for Santa’s favourite cookies for you to bake today to put out for Santa tonight. Before you go to bed tonight, here is some reindeer food to sprinkle on the grass outside and a tray to fill with milk and cookies for Santa and a carrot for Rudolph! Get excited, because Santa is coming tonight and you both have been good boys this year, and good boys get presents from Santa! 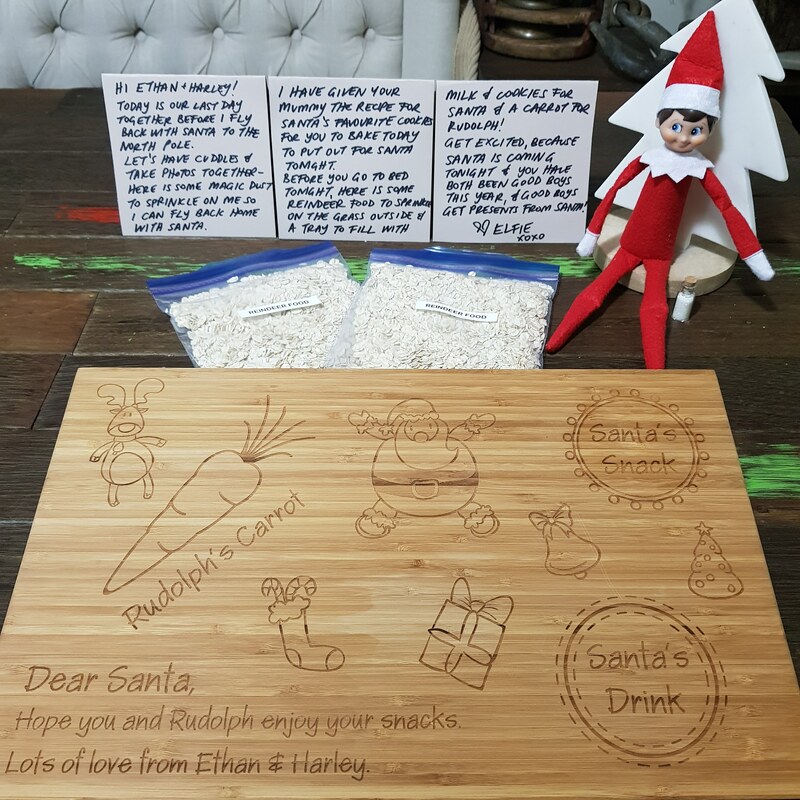 Note: Reindeer food is oats, Magic Elf dust is glitter, and Santa Snacks board is from Thermoart. 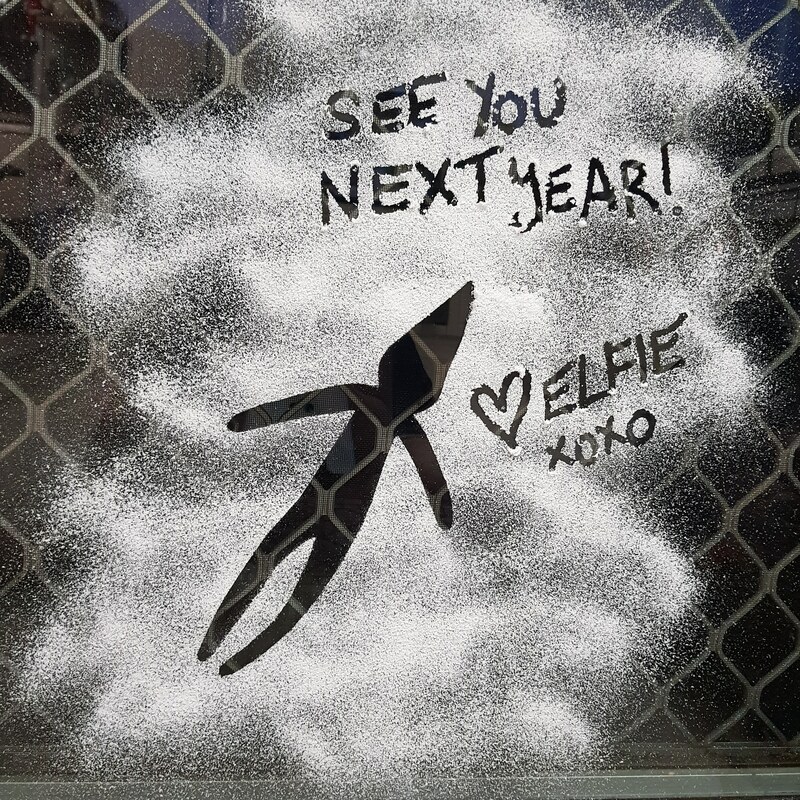 Day #25 – Farewell Elfie!